Egyptian cartoonist Doaa Eladl has been threatened for her popular cartoons decrying religious fundamentalism and sexual harassment. "Explicit threats against me and the cartoons I publish on social networks are still being expressed and have even increased in ferocity ," says Eladl. "Such threats have become commonplace these days and are experienced by many journalists and cartoonists in these turbulent times in Egypt." Last year, Eladl was facing charges of "blasphemy" for a cartoon critical of the politicisation of religion. 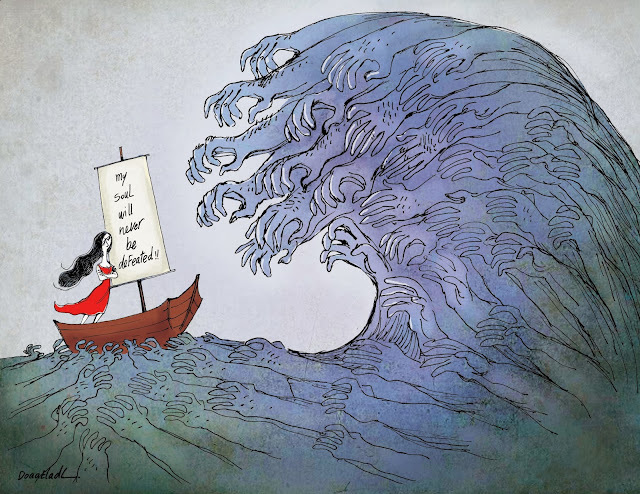 In December 2012, Salafist lawyer and Secretary General of the National Center for Defense of Freedoms Khaled El Masry filed a lawsuit against Eladl and her editor, claiming that one of her cartoons published online by the newspaper Al-Masry Al-Youm insults the Bible's Adam, a prophet figure in the Muslim religion. An investigation was launched by the Attorney-General but was dropped after Egyptian President Mohamed Morsi left office. Aladl's cartoon features an Egyptian man with angel wings lecturing Adam and Eve. The three are on a cloud beneath the infamous apple tree. 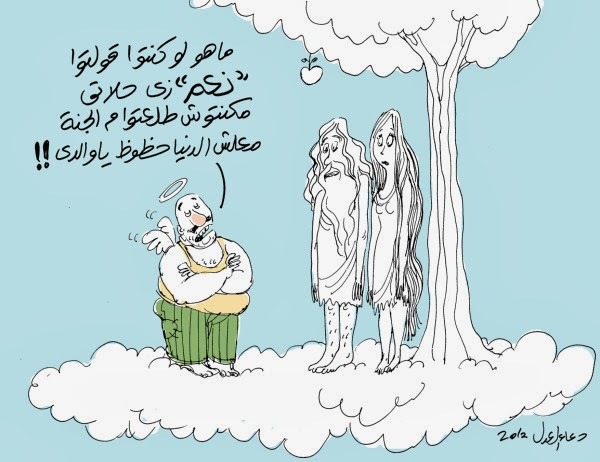 The man is telling Adam and Eve that they would never have been expelled from heaven if they had simply voted in favour of the draft constitution in the recent Egyptian referendum. Some of the supporters of the referendum were quoted as saying a “yes vote” guarantees one a spot in heaven, while a “no vote” guarantees one a spot in hell. According to CRNI, "Other cartoonists report being told that people who hold opinions contrary to the Salafists are anti-Islamic. This is all consistent with efforts by certain Islamic parties and organisations (since the publication of the 12 Danish cartoons in 2006) to change the United Nations human rights policies that currently protect blasphemy, or insult to religion, as free speech."